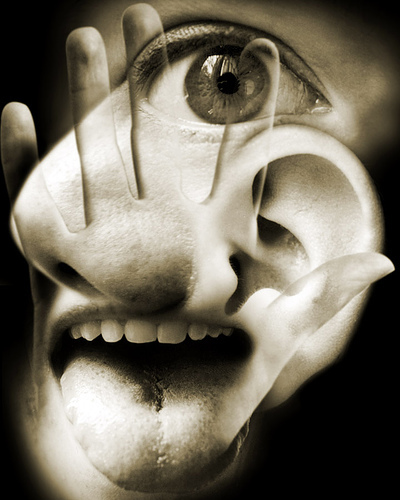 Aristotle is said to have first described the traditional 5 senses which relate to external body parts (sight via the eyes, hearing via the ears, touch via the skin, smell via nose and taste via mouth). Thanks for the links ! I found a verse of ancient tamil poet , namely tholkapiyar, who lived B.C period , has explained about 6 senses in his poem. Hence, i raised this question. Here is his poem in english fonts. 'Touch' is the first sense. 'Taste' is the second sense. 'smell' is the third sense. 'sight' is the fourth sense. 'sound' is the fifth sense. 'mind' is the sixth sense. - From the ancient book 'Thokapiam'. As said it in this poem, it should be chronological order. Some details about this ancient tamil poet are here. He is the poet lived before the CHRISTIAN era. Another ancient tamil poet , who is 2000 year old has mentioned about 5senses in many places of his poem. His name is thiruvalluvar. Below is the link. Just use the Ctrl + f from key board and find the word 'sense' in the following link page. It is easy to see his usage of this word 'sense' as well. some interesting fact is that metaphorically he convey his message by mentioning some simile in one of his verse, where he describes in one verse that '. . . such peoples are same as one sensed tree'. That is the touch sense. some reptiles lacks hearing sense. 'Taste' is the first sense. Thanks for explaining your question. By the way, regarding your translation... you mentioned 'taste' twice (as the 1st and 2nd sense). A translation mistake...? yes martijn, i corrected that mistake promptly before your message. Touch is the first sense. plants and trees has first sense. it is mentioned by ancient tamil poet. tiruvaluvar. Thus, Tholkapiyar has written about senses in unique order.